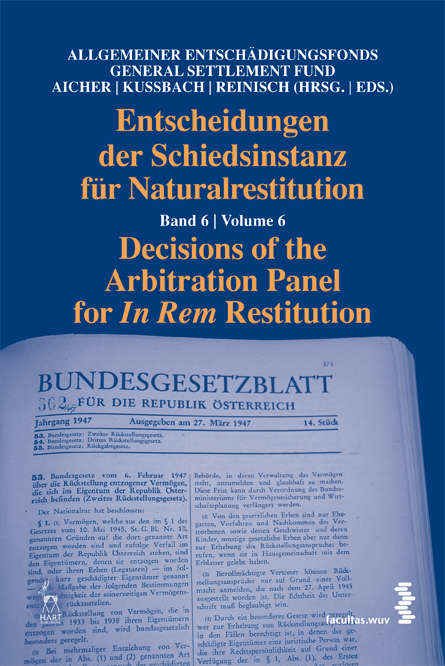 Volume 6 contains ten decisions of the Arbitration Panel for In Rem Restitution dating from 2008 and 2009 with rulings on applications for restitution of properties situated in Vienna, Lower Austria, Upper Austria and Burgenland. In rem restitution of properties is recommended in three of these (nos. 481/2008, 482/2008 and 507/2008). One of the two applications for reopening which are documented in this volume relates to an application for restitution of movable property.